Following this discussion thread at the CFI/Point of Inquiry forums, I’ve decided to announce my show’s guest a week early from now on, and call for audience questions for him/her. I’ll take a sampling from those questions that appear on the forums, and ask them on the air. So any questions for Michael Mann? If so, leave them here–and they may just make their way into the interview! Also, compose your questions sooner rather than later, as we’ll be recording fairly early on this week….. Since when is finding and pointing out a mistake in a scientific publication considered an “attack” on science and scientists? To what extent are consensus climate projections dependent on assuming gaussian statistics for climate phenomena? Could “fat tails” mean that global warming might be more catastrophic than we have assumed, or less? Also, because it hasn’t been singled out for political opposition, we aren’t hearing much about global dimming in the press. Is that scientific consensus similar to global warming, or is it more controversial among climate scientists? What confidence can we have about projections that combine the effects CO2 and particulates, since both appear to be strong effects? That bill represents the ideological instead of the religious part of the conservative base, but it uses the same language (“balance” and “teach the controversy”) that fundamentalists advocate for evolution. It also mandates teaching complicated controversies (and non-controversies) to students before they learn the underlying science, just as the creation science bill in Louisiana did. Ask him about how Phil Jones is doing. Is it possible to support him in some way? And ask him how much of his budget goes to public relations and environmental advocacy, or even global warming mitigation advocacy. Along similar lines, ask if his dept. at Penn State gets more money now that there’s more of a consensus on AGW. The denialists bring these up all the time, it’d be good to get a typical case on the record. Along slightly different lines, there’re efforts like Gore’s – it’s stated he’s raised $300M for AGW advocacy – on the other hand, we have apparently defenseless scientists all over the world. So, should there be an equivalent to the National Center for Sciene Education? The NCE is focused on evolution, so would it be good to have a similar organization for climate science? If so, I ‘d recommend it not have similar initials – maybe something like the Center for Defense of Climate Science. I suppose a good overarching question would be, What picture do we get of the earth’s climate in it’s 4.5 billion year history? Are there trends? Patterns? What constitutes change, especially change by man-made means, as opposed to what actually constitutes natural climate evolution? Just some thoughts… Look forward to it! The 2006 Wegman Committee was composed of 2 PhDs in Statistics + 1 PhD in Mathematics. This Committee investigated the statistical methodology behind your Hockey Stick construction and found it flawed. Question: Considering that you are not a PhD in Statistics, why did you not agree with the Wegman Report findings and revamp your statistical methodology? Please provide detailed specifics. Odd how you and some of the other climate-change religionists didn’t think your attacks on those climate scientists who have argued against anthropogenic causes for the present warming trend were “unprecedented”. But then it is always different when it is you, yourselves, who is under attack, eh? What can Michael Mann say about the total lack of ability of the denialists to interpret statistics such as confidence intervals, which they have no grasp of? However, The facts add up to this. You can say with 70% confidence that it has warmed since ’95, in other words, it is more likely than not, but there remains a 14% chance that it cooled during the same interval. This is not the 6C per century kind of warming we were all warned about. The 99% confidence is -1.59 to +3.49 in °C/century. This is assuming that the data are not infected with UHI, which they clearly seem to be. That log you’re holding in the picture, with the grossly asymmetric pattern of tree rings – which side do you have to drill from to get the biggest global warming signal? Seriously, if you was going to ask a question, I’d want to know what his mathematical justification was for using decentred stepwise PCA as opposed to the normal PCA that every other statistician in the world uses. Why invent a completely new method with unknown statistical properties, and then try to apply it for its first use to report discovering a previously unexpected signal in real data? But of course you’re not going to ask, and he wouldn’t tell you if you did. He’s not coming on here to answer inconvenient questions. Waste of time even mentioning it. Reading the Wikipedia article on the hockey stick controversy and the temperature record of the past 150 years to get a better view of this, it appears that within the past 150 years there has certainly been warming. It appears that several studies with different methodology that addresses the concerns of the Wegman committee have produced the same graph; Gerald North, despite agreeing with the methodology concerns of the Wegman committee, has serious doubts about the impartiality of the politicians attached to the committee; and the report repeats two previously refuted claims by the NAS, among other issues. (And honestly, McIntyre and McKitrick are not exactly either qualified or impartial in making their claims on this; McKitrick is an economist, which last I heard, confers no training in the scientific method, and McIntyre has a math degree and read briefly in philosophy, politics, and economics and works for the mineral business, which is slightly less cruddy but makes me wonder if the dude has had any statistics training!) Wegman and the others seem to have adequate credentials, so I have less issues there. I’m somewhat wary of the Wegman committee’s statistics-fu, though. As I just said, I’m not sure they’ve exactly got a grasp of the scientific aspect of it (c.f. their repetition of refuted claims by the NAS), even though their statistical criticism is not quite as bad as some others. No, you can’t say that about confidence intervals set on trend lines. The confidence interval means that if the underlying physical process generating the data consists of a linear trend plus noise following a particular defined statistical model, then the probability of getting the observed result with a trend outside those bounds is less than 1%. The statement depends on the statistical model being valid, at least locally. We know that the linear trend does not extend indefinitely into the past, you’re approximating the derivative of a smooth function with that line, so you can’t extrapolate it into the future either. It can only potentially tell you what is happening now. And the noise model is unknown for real weather, and could easily give rise to spurious correlation if it has strong long-term persistence or other forms of autocorrelation. Either would invalidate the simplistic calculation of the linear least-squares confidence interval, rendering it meaningless. In any case, it’s totally irrelevant whether it has warmed since 95. What matters is whether the warming or its absence is within the range of natural variation over times greater than a hundred years. We don’t have the data to be able to answer that on a global scale, but we have local records for some places going back a number of centuries, and they show that on a local scale at least the current warming is not unusual. The Central England temperature series (HadCET) showed a similar warming episode from about 1690 to 1733, only longer and steeper. That’s why paleo-reconstructions of temperature are so critical to the AGW argument, and why the idea that you can measure the global temperature, including oceans, deserts, and ice caps, to an accuracy of a few tenths of a degree by using trees as thermometers. Oh please, I gotta hear this one. Please please please! That’s just switching the goalposts around. The question is, is the Mann98 reconstruction correct? Because if it isn’t, then the error needs to be acknowledged and the paper withdrawn, all the subsequent papers that relied upon it need to be re-examined (and some of those other studies actually used the Mann98 data as input</i, while many others used the same suspect Bristlecone trees), and one needs to consider carefully how it managed to pass all the multiple layers of checking that were supposed to be in place to become the headline diagram of the IPCC report, and then escape detection for a further three years. Was it the only one? The implications of that extend far beyond this one paper. If I were to propose a new method of cancelling fractions in which from 64/16 you cancel the 6 to get 4/1, in 98/49 you cancel the 9 to get 8/4, and so on; does it matter scientifically that you got the right answer by the wrong method? If somebody got the wrong answer by the wrong method, and somebody was to show that it was the wrong method, does it really prove anything to cite 20 other people who got the same answer by small variations on the same method? So never mind all the other papers, is the Mann98 Hockeystick calculated by a valid method? I suggest you look up some of the more advanced Econometrics textbooks. Professor McKittrick as an economist is very well qualified to comment on time series analysis, which is what this is. Sorry, that last comment got messed up. I’ll try again. That’s just switching the goalposts around. The question is, is the Mann98 reconstruction correct? Because if it isn’t, then the error needs to be acknowledged and the paper withdrawn, all the subsequent papers that relied upon it need to be re-examined (and some of those other studies actually used the Mann98 data as input, while many others used the same suspect Bristlecone trees), and one needs to consider carefully how it managed to pass all the multiple layers of checking that were supposed to be in place to become the headline diagram of the IPCC report, and then escape detection for a further three years. Was it the only one? When McIntyre and McKitrick submitted that same question to Nature and the journal rejected it due to deficiencies in their argument, this should clue you into the substance of the claim and give you pause in repeating it elsewhere. MBH98 reconstruction is recovered even if PCA is not used at all to represent the North American ITRDB Data (i.e., each individual tree-ring series is used as a predictor with equal weight in the analysis). Oops, that last graph should have Mann quotes around it. Also, it was my understanding that McIntyre’s work has been discredited by others in the field. I would be very interested in a citation for this claim. Just so we don’t get confused, I mean the thousand year part, not 400 or 600 years. But the actual part of the reconstruction that is in dispute, the MWP. It turns out that the source of your claim from the Wikipedia is a comment without substantiation from RealClimate. Is it your position that a statement from Gavin in the comment thread of a blog is a primary source? It seems to be for the Wikipedia, since that is where the footnote goes, and the trail dies. The journal rejected it because it is standard practice to reject articles that express scepticism. At the least, they have higher hurdles to climb. I gather it was rejected for being too long. And then when it was shortened and resubmitted, for not providing enough detail. One climate scientist, on reviewing a paper that (it was said) showed that the method of reconstruction that used in dendroclimatology (reverse regression) is wrong, biased, lousy, horrible, etc., said “It won’t be easy to dismiss out of hand as the math appears to be correct theoretically”. That is, on the face of it an outrageous statement. I truly believe that they don’t mean it deliberately. I think they are so utterly convinced they are right, that any paper showing them to be wrong is shown by that fact alone to have some hidden fatal flaw in it, and they’re being perfectly reasonable in keeping bad science out of the journals. It’s called confirmation bias, and everybody has it. But rather than argue about that, why not simply ask him to put the maths up? I’m pretty sure there are a bunch of people out here willing to take a close look at it. Actually, that’s the outrageous statement. It’s a hefty assertion to be throwing around about a top-tier science journal. Have any justification that Nature’s standard practice is to censure skepticism? Leaving it as is sounds kooky. Does he have any any ideas about what could have been done differently in responding to the stolen emails controversy? And it would be good if he could kind of recreate some of the instances where he used strong language in the emails (and perhaps you, Chris, could put that into the context of some of your war on science reporting). And tell us about your life among the Hollywood elite. Thanks. But Rutherford et al. didn’t perform an independent verification of the result, they performed another sort of calculation but using Mann’s uncorrected decentered PCA data as input, and then effectively claimed the fact that they got roughly the same result as showing the errors didn’t matter. This was verified by comparing the data Rutherford archived with the Mann98 PC1 series archived with the Mann98 Corrigendum. But what I was asking for was not yet another analysis showing the same result, but the maths to justify the original result. How is decentered PCA justified mathematically? You can’t say “because doing it by a different method gives the same answer” because I could use the same technique on my 64/16 cancel the 6 to get 4/1 example above. Why not judge for yourself Mr McIntyre’s work. You seem capable of it. Unlikely you will be bamboozled with your training. Why not have a look? Ask Mr. Mann if he has proof that sea levels are rising. The real evidence says they are not. trend, and to have a sea-level rise, you need a trend. 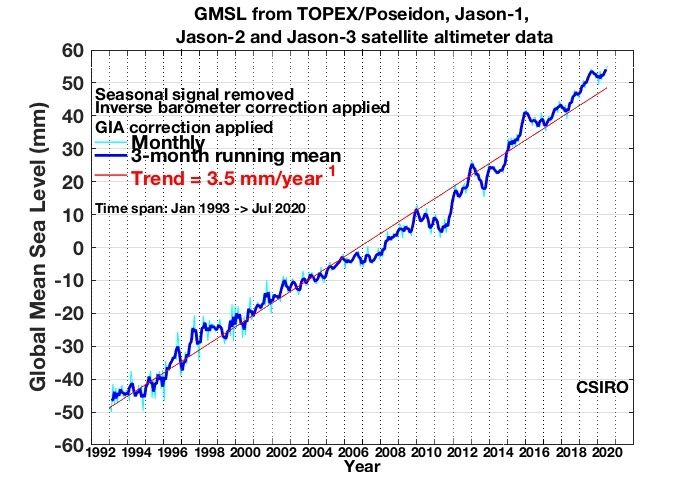 Then, in 2003, the same data set, which in their [IPCC’s] publications, in their website, was a straight line—suddenly it changed, and showed a very strong line of uplift, 2.3 mm per year, the same as from the tide gauge. And that didn’t look so nice. It looked as though they had recorded something, but they hadn’t recorded anything. It was the original data which they suddenly twisted up, because they entered a “correction factor,” which they took from the tide gauge. outside; it’s not a measurement. It looks like it is measured from the satellite, but you don’t say what really happened. And they answered, that we had to do it, because otherwise we would not have gotten any trend! That is terrible! As a matter of fact, it is a falsification of the data set. Why? Because they know the answer. And there you come to the point: They “know” the answer; the rest of us, we are searching for the answer. Because we are field geologists; they are computer scientists. So all this talk that sea level is rising, this stems from the computer modelling, not from observations. The observations don’t find it! Interesting. I didn’t know Michael Mann – a paleoclimatologist – was an expert on sea level trends. I guess in a skeptic’s mind, if it’s relevant to climate change, any scientist who has ever published in any speciality should be an expert in every specialty. More interesting, Morner (the source of your cut-and-paste interview above, Busiturtle) is a rather vocal proponent that dowsing should be a scientific field. Why do all of these skeptics end up having some other wacko views like this? Interesting, bilbo, that you offer no retort to the scientific claims Morner makes. Is it too inconvenient to actually reply with substance rather than personal attacks and misdirection? If sea levels are not rising AGW is a solution in search of a problem. I’m not exactly sure how I’m supposed to respond to a dude just claiming that people made stuff up because he didn’t expect their results to happen. That’s kind of unverifiable either way. Anyway, my actual point was to highlight that you’re asking Michael Mann a question out of his field of specialty. That’s like asking Michael Jordan to swim for a world record in the butterfly to prove that he’s a good basketball player. First, McIntyre has never satisfactorily shown it was the wrong method so your argument from analogy doesn’t apply. Am I wrong? Show us the devastating maths? Remember, McIntyre’s argument wasn’t even good enough to qualify as a comment in the same journal Mann published in. This gets back to the prior problem of you imagining a wild and crazy ant-science conspiracy happening at Nature right before our eyes. How do you explain that? As everything else involved in the AGW discussion, very few of the “talking points” – things pointed at as being somehow “proof” of something, are inevitably less straight forward the a direct “causeeffect” problem as most of them have several likely causes and which one is in play is not always very clear. The above quote is from http://www.eurekalert.org/pub_releases/2010-01/uoh-tsl012610.php I am assuming they are planning to release a paper on it, though I haven’t seen it yet. But to reinforce what many have tried to state Dr. Sivan concludes by stating “”Over the past century, we have witnessed the sea level in Israel fluctuating with almost 19 centimeters between the highest and lowest levels. Over the past 50 years Israel’s mean sea level rise is 5.5 centimeters, but there have also been periods when it rose by 10 centimeters over 10 years. That said, even acute ups and downs over short periods do not testify to long-term trends. An observation of the sea levels over hundreds and thousands of years shows that what seems a phenomenon today is as a matter of fact “nothing new under the sun”. So, what would one wish to call “normal” when there has been a fluctuation of 19 centimeters over a century, with a one-meter difference between the highest and lowest levels over the past 2,500 years? While “most of the time it has been lower” may indicate the trend, if it is a rising level trend it is a trend that has obviously been going on for far longer than the industrial revolution. I assume those charts are for marketing purposes only. Otherwise there is the real problem that the model suggested by the simple linear trend will suggest results that are nowhere close to the observed data. And as Dr. Morner states, one cannot claim sea levels are rising if the fundamental physics of angular momentum disprove it. Given a choice of tree rings or the law of conservation of momentum I know where I’m betting my money. IMO this is the fundamental problem with AGW science. It is so invested in computer models and statistical methods that it ignores data the can actually be observed and measured. And over time the chasm between what is predicted and what is real only grows larger, leaving AGW advocates in a precarious situation. I’m no expert but Dr. Sivan sounds like she’s overselling her data. First, Israel is on the Mediterranean Sea and is relatively isolated from the Atlantic and Pacific. Is it safe to assume Israeli coastlines are under same influences as oceanic coastlines? For instance, due to high evaporation rates the Mediterranean has a much higher saline content than most of the Atlantic. In other words, Mediterranean sea level is influenced by unique evaporative forces. That, of course, only holds true if you ignore all of the “data that can be observed and measured” that climate scientists actually use in their studies. Cherry-picking just the modeling studies as evidence and ignoring all of the others (many of which have observed data that back up the models) is what you’re doing. But willful ignorance is no excuse for uninformed skepticism. Also, ALL of science is “so invested” in “statistical methods.” Statistical methods are used in literally almost every single scientific paper that’s published. In any field. Get your stuff straight, Busiturtle. Using statistics isn’t a weakness of science, Busiturtle. If you try to criticize scientists because they use math too much, you’re making yourself look foolish. Perhaps you’re also ignorant of just how many studies that use observed data are out there? It sounds like it. The use of statistical methods to produce results that conform to a hypothesis is not science. Or as we all have memorized: There are lies, damned lies and statistics. The central issue is the hyperbolic claims of the IPCC are collapsing before are eyes. This draws attention to the lack of integrity in the work of the IPCC and how it could be that so many fraudulent claims could find their way into a “peer reviewed” paper. It also begs the question of whether the environmental science community will change its ways and embrace more open inquiry into climate science. Watch this, I will ask PJ to back up this statement, and he will tell me that the answer is in the “science”, or something similarly vague, and he is under no obligation to cite any studies to back up his assertions. How does that work exactly, PJ? Which studies? Explain to me how those specific studies, or that study, backs up the models in any significant way? I’m no expert either, only pointing out that sea level is not quite so straight forward as “warmer means higher levels”. A “rise” or “fall” may or may not be related to climate change – it could be a geological plate change. There is also an indication in this study that there is quite a larger range of “normal fluctuation” than many may have thought. The “skeptics” are generally accused of being sloppy with the data and lacking on their knowledge regularly, yet I see just as much of that in many of the arguments of those arguing in support. This is just another example of the need to be very careful in what one claims is an observable phenomena that they wish to use as “proof”. Interesting article and use of a model – but remember, the model “proved” what it got coded to prove, the underlying assumptions may or may not be correct. The model just shows that if the assumptions are correct they get a reasonable match (the math worked). There may or may not be other factors involved. I do agree that such studies are very important for furthering our understanding, and as indicated in your linked article our understanding is still far more limited than many think. We know changes in ocean current are complex and have large effects – but we are still at the guessing stage of understanding those changes (including what causes the changes) and resulting effects, we are nowhere near certain of them yet. Considering how much of an effect they would appear to have it is an area I hope we do a lot of further work on to increase our understandings. I suggest Thomas L. you wait until the study passes peer review before saying what it indicates and doesn’t indicate. Scientists don’t work in “proofs,” which is why deniers can easily cherry-pick their caveats. And no we are not “still at the guessing stage.” You only insist this because you disagree with the consensus view that AGW is real and likely bad for the species. Yours is an unreasonable stance because you haven’t done the work of saying what kind of evidence will be enough evidence. Clearly you’re not swayed by majority opinion of those doing the work who say there is plenty of evidence. Where does that leave you? Ask him what number he put down for Phil Jones’s publications in his nomination papers for an AGU Fellowship. Dismissing models out of hand again, are we? We both know you have no idea what algorithms the models were based or any of the assumptions behind the program. And you can’t make up your mind that the models are inadequate by reading a EureakAlert article. You simply cannot do it. Either you already have the expertise and are willing take the time to look at the raw data and the model or you must leave it to others who can. This is how peer-review works. I have never said anything close to “it’s too late to do anything anyway”, and have in fact stated I am all for doing many things, but with the added acknowledgment that everything is a trade off -> thus we need to understand what we are trading when we, as a society, agree to try something. I’m a firm believer in moving towards a more energy sustainable and independent future, but in the process of getting there the economic realities of our nation need to be kept in mind and we need to be careful because we aren’t going to have the money to deal with being wrong and needing some other response. Thus I state in numerous threads there is much we can do that would actually have more immediate results (maybe not enough, but at least we would be starting). I do think “Cap and Trade” is a messed up “solution” because it doesn’t actually solve anything. Yes, the multi-national companies where willing to go along – do you really think they care where stuff gets produced or what it does to our economy? If you do then all I can say is you obviously have never spent much time in business. They will still be making money. How old are you? I ask because I wonder if you are old enough to have lived through a serious economic “hick-up” (which means you were an adult by the end of the 1980’s at a minimum). The environment will be the last thing anyone cares about when they are trying to figure out where their next meal is coming from (ever spent any time in a truly poverty stricken area or third world country? If so how much did you see anyone caring about the environment -> not the politicians, but the populous?). Such things are easy to discuss in the abstract, living through them is nowhere near as comfortable. I am not “dismissing models out of hand”, only stating they have their limits. Have you ever built a model? If so, where the results ever a “surprise”? Understand the process before you jump to the “oh, look what we just proved!” thinking. I have stated in here numerous times I am not pro or con AGW (if push came to shove I would be more “pro”, as with over 6 billion of us to think we aren’t having an effect on the environment would be rather naïve. In fact as I recall from my environmental politics class 25 years ago the question, even then, is not if we’ve broken they eco-system, but rather how badly…). I do see serious limitations in what we claim to know. I also have failed to find anything in the literature that would support the alarmist claims (which does not imply there are not some serious issues that may arise, but the world is not ending…). It would appear from the papers published over the past year that quite a bit is still being discovered, and in a few cases “causes” have turned out to be quite more involved and not what was originally thought. Should we just throw money at things, or should we make sure we understand the issue and then target what money we have to spare on it appropriately? So paint me with whatever brush you insist (because your political framing comes out at every turn) – in reality I am just someone who is capable of thinking and isn’t very interested in hyperbole. I also recognize there are limits to what society at large is willing to swallow – and forcing more than that has never led to happy endings. While PJ, Bilbo, gillt, and Jon et. al. were here telling us that climategate meant nothing, and that the temp data was sound, and that Steve McIntyre is a tool of the oil industry, the UK Met office is rebuilding the CRU temp series from scratch, employing open methods and statistical audits and open source code. As a quick primer for how models are used, as well as how they are calibrated and validated using observed data, I suggest you read the IPCCs own publication about how scientists do it (see here or here). Their methods are vastly different from the ones you and Busiturtle attempt to paint (in fact, you seem to be echoing some incorrect and some outright false statements about modeling that one sees in the skeptic blog world a good bit). That’s not the only link, of course, but since you told me once that “if I make a claim, it’s up to you to go read up for yourself about it,” I’ll invoke that denialist rule here. I won’t expect you to dislike that idea, seeing as how doing so would dredge you into the depths of hypocrisy. One last thing: no model – ever – will provide a pinpoint accurate prediction of temperature, sea levels, etc., no matter how good it is. Models simply aren’t built to do this, and that includes climate models. Models are instead used to examine the operational nature of a system, not provide on-the-spot predictions of numerical values. Climatologists acknowledge this, as do scientists in the MANY other fields where models are used (if you didn’t know it, models are ubiquitous – that means everywhere – in science these days. If you take medicine, for example, you’ve got a model to thank which likely didn’t accurate predict any sort of ‘values’). The only people who seem to (incorrectly) think that the only way a model can be valid is if it nails predicted temps right on are denialists and non-scientist climate change proponents who don’t understand the field. moptop’s latest link is a good primer of how denialists link to actual documents but blatantly misrepresent what they say. In other words, “we want to get some more data to make our dataset more robust” gets spun into “we’re totally wrong and we know it” in Denialist Bizarro World. Well put, bilbo. I was about to write something very similar. If trying to up your sampling effort was evidence that science was wrong, nothing in science would be right. Isn’t Lubos Motl (the author of the blog moptop just linked to) the same guy that told Mooney once that he should be (quoting) “the first one against the wall when the revolution comes?” Anyone? I very well might be mistaken, but that name struck a familiar chord. ““if I make a claim, it’s up to you to go read up for yourself about it,” ” I said that? Boy, I there must be some other moptop around, because Bilbo claimed that I said I had disproved a model with a “very sophisticated computer in my basement. Anyway, I claimed that you would reject the responsibility to back up your claim, and you did, by making a lie up about me. As for the Motl article, in the words of the great Bill Clinton: “Deny, deny, deny…” The re-assessment is happening, as demanded by “oil industry tool” McIntyre, and pre-judging the outcome doesn’t change that. I never said they were totally wrong, either, I said that it was impossible to know given the state of their records and the secrecy, born out by climategate, of their methods. I didn’t make anything up, moptop. I provided you some info to serve as a springboard for you. I suggest you read it if you’re genuinely interested beyond hurling flaming arrows. If that wasn’t you who said that quote, I apologize. I get told by so many skeptics on this blog the mindnumbing statement that it’s not their job to substantiate their own claims that it’s begun to sound like a parrot. Do you ever get tired of this act? Do you ever wonder if anybody notices that you do the same deflection each and every time anybody tries to get you to back up anything you claim? Naah! I am sure you don’t, You wouldn’t be Phil Jones Jr, would you? Using a wrong method in a scientific paper is “irrelevant”? How so? First, McIntyre has never satisfactorily shown it was the wrong method so your argument from analogy doesn’t apply. Am I wrong? Yes, you’re wrong. He published the proof, and the computer code, many years ago. If you use Mann’s PCA method on artificially generated red noise random sequences with no trend, it produces Hockeysticks 95% of the time. And the reason for it is perfectly understandable in the maths. Decentered PCA biases the result in favour of larger variances in the calibration period, which has the effect of mining the data for Hockeystick shapes, and weighting them more heavily. Show us the devastating maths? Remember, McIntyre’s argument wasn’t even good enough to qualify as a comment in the same journal Mann published in. You have got this ‘burden of proof’ concept the wrong way round. There is no such thing as “proof by you not being able to prove me wrong”. If Mann cannot prove his method valid, he can’t use it. The fact that he hasn’t offered a proof is sufficient in itself. It’s an added bonus that we know no such proof is possible, because we can show that the method is wrong. But even without that, the failure to show a proof would return the result to the status of an unknown at best. You also seem to be trying to deduce that McIntyre’s maths must be wrong because Nature wouldn’t publish it, rather than discussing the maths. I did it the other way round. I looked at the maths, concluded McIntyre was right, and as a result deduced that Nature had some other reason for refusing it. As it happens, it isn’t very difficult. Principal Components Analysis (PCA) is a standard technique in which a dataset is rotated about its centre so that its variances line up with the coordinate axes. Think of a cloud of points making up an ellipsoidal ‘cigar’ shape in space. You draw your new coordinate system aligned along its length, so that most of the variance is in the direction of the first axis (this coordinate is called the first Principal Component or PC1), the next largest spread along the second axis, and so on. You can think of it as the ‘natural’ coordinate system to describe the way the data varies. To make sense, you have to rotate the cloud of points about its centre, which is done by subtracting the mean. But Michael Mann didn’t do that. He only subtracted the mean for the bit of data in the 20th century, where he had his comparison data. This has the effect of rotating the cloud about an off-centre point, and then when you line up the maximum variance along the first axis, part of the variance is due to this offset. It biases the result towards the direction of the offset, i.e. it looks for a large 20th century spike. It wasn’t a deliberate attempt to deceive. I think Mann didn’t quite understand what PCA did – it was just a tool he found in the toolbox – and he figured that since he only had temperature data in the 20th century to compare to, he ought to subtract the mean of only what data he had. He thought he was doing PCA right, which is why he wrote in the paper that he was doing “standard PCA”, without giving any details. But he wasn’t, and it isn’t. Mathematically, it isn’t a particularly difficult or controversial point. In PCA, you subtract the mean of the whole dataset, because except in the most unusual circumstances it’s the correct thing to do. And it is because of that that Nature’s unwillingness to let anyone say so is so peculiar. I’m not alleging any conspiracy here. (Although conspiracies to boycott other journals that published sceptical papers are indeed to be found in Climategate.) All I said was that it was standard practice to reject sceptical papers, and I explained that I thought the reason probably was that they were so convinced AGW was right, that any paper that claimed otherwise must ipso facto be flawed somehow, even if they couldn’t quite see how. Keeping flawed papers out of the journals is clearly a ‘good’ thing to do, especially on such a ‘politically important’ topic. And nobody wants to catch flack for being ‘a denier’. So sceptical papers are scrutinised far more thoroughly and weaker excuses for rejecting them used. I find it ironic that people can imagine wild conspiracy theories about an oil-funded organised campaign of disinformation being ‘pumped’ out, applied to the great number of sceptics entirely without proof, and yet complain that any hint that academia is rife with politics and human frailties, that its imperfections are not rare and isolated, to be a ‘conspiracy theory’. No. No conspiracy is required to explain it. Just common motives, common beliefs, self-interested academic politics, and a bad dose of groupthink and confirmation bias. A lot of mathematical jargon that sounds professional but makes absolutely no sense in the context of the method you’re talking about. Nice. Nullius in Verba, I’ll make this real easy for you: instead of making a few assertions about Mann’s methods, cite the published peer-reviewed paper that refutes Mann’s PCA method. Not only is Nature and all its editors and writers involved in some huge unprecedented effort to squash critical remarks about the esearch they publish–It’s not a conspiracy though!–the NAS must also be in on it because they support Mann’s findings as well as some independent reconstructions which produce the same results. I understand how much fun it must be to posit a mass conspiracy, but you do realize it sounds insane. And lets not forget that for all his character assassinating efforts McIntyre has only two publications, neither well received. What can AGW believers offer non-believers, to interest them into joining their church? Explain the similarities and dis-similarities between say the Church’s of AGW, Catholic, Buddhism, Methodist? Does the Church of AGW give it’s believers the freedom to debate, discuss or study other religions? Because AGW is faith based, does AGW belief carry over to creationism? How do you feel about mixing AGW religion with government policy? How close or far away do you think this co-mingling is – from honoring separation of church and state? I’ll be happy to expand. I was trying to be concise, (and failing). Red noise is a form of noise in which each error value is strongly related to the values immediately before and after it. They are common in cumulative physical processes, and when data is smoothed before use. Since the oceans accumulate heat from year to year, the effect is expected, and simple statistical tests (measuring the autocorrelation) easily verify its presence in the temperature series. You can generate an example of a red noise series for yourself by making each term of a sequence 0.995 times the previous term, plus a zero-mean Normally distributed random kick. (It’s called AR(1), if you want to look it up.) If you plot it out, you’ll see that it’s visual appearance is remarkably similar to weather data (although weather is more likely to be a more complicated form of noise of a type called ARFIMA, the details of which are not relevant here), and over short time intervals it appears to have rising and falling trends. These are, however, spurious effects appearing randomly, and in the long run there is no trend. It’s properties are a bit counter-intuitive, and it needs special modifications to statistical tests to handle. The classic book on the subject is widely known as ‘Box and Jenkins’, which gives all the gory mathematical details. Decentered PCA is a common term for doing PCA without centering the data first. PCA I’ve explained above. Variance you ought to know – let me know if you don’t and I’ll expand further. And the calibration period is the part of the record for which we have temperature data from thermometers, than Mann et al. were lining the tree rings up against. Tree rings come with no temperature scale to say what temperature corresponds to what ring width/density, so you have to stretch and scale the tree ring series to line up to the temperature record, in order to calibrate you ‘treemometer’. The problem is that Mann subtracted the mean only in this calibration period before rotating to find the PC1, which he was planning to match the temperature data up to. So any tree ring series that have a large variance during this time, caused for example by ramping upwards rapidly, give a bigger offset and pulls the alignment of the PC1 along their direction. In effect, they get more heavily weighted than they ought. And it so happened that there was a bunch of trees with such a rise in the data, the Bristlecone pines collected by Greybill and Idso, although it was already known that the temperature where they grew had not increased during the 20th century. Greybill suspected that the growth spike was due to chemical fertilisation of the trees from man-made pollution, (acid rain, you might say) and rising CO2. It’s not the only theory, though. The Bristlecones shouldn’t have been included, since it was already known that they weren’t sensitive to temperature, but they were. This combined with the bias from failing to centre the data weighted them far more heavily than all the other trees, and resulted in an exaggerated 20th century rise compared to past variability. Lining it up to the 20th century temperature then did the same to the temperature reconstruction. I’m about to go offline, now, but if you’ve got any further questions I’ll probably be back tomorrow. Cheers. Oh. OK, a quick one. You’re asking for an argument from authority. Argument from authority is invalid. It’s unscientific. There’s no point in me citing such a paper, since you’ll just dismiss it as non-authoritative. The refutation is in the maths. It’s not in the qualifications or job title of the author, or the august reputation of the journal. It’s in the maths. For what it’s worth, the refutation was given in the famous McIntyre and McKittrick papers, which were indeed peer reviewed and published. But I set no weight by that. The refutation is in the maths. The effort required not to publish is not huge, and the NAS report didn’t support Mann’s method. Mann had claimed unprecedented warming in 1,000 years. The NAS said that was not supported, and that Bristlecones should not be used, but that other reconstructions meant the conclusion was probably true back to 400 years, and maybe further. Something we already knew, and was not in doubt, because that dates back to the Little Ice Age. In other words, a partially right answer by the wrong method. Agreed – which is why I didn’t. But would you say the same about the ‘oil-funded conspiracy of tobacco-lobbyist/creationist deniers’? And now I really must go. No, I’m asking you to cite a paper, any paper, that has the actual work that disproves Mann’s model. Why can’t you do that? There’s a paper trail that leads to industry funding of various “skeptical” organizations. There’s a clear record of scientists who were once tobacco “skeptics” and are now AGW “skeptics.” There’s a clear record of who those scientists were working for. There’s no paper trail–or any other evidence–that leads to Nature’s out-of-hand rejection of papers that express skepticism or to a massive worldwise conspiracy of climate scientists. If publishing isn’t that big an effort, why shouldn’t people be asking you for peer-reviewed papers? It’s a handy way to separate the wheat from the chaff. Of course, it’s imperfect, but it’s a pretty darn good first approximation. I can. But it’s totally missing the point because relying on peer-review is exactly where you are going wrong to begin with. It’s a fallacious and illogical method, known as argument from authority. It doesn’t work. It’s unscientific. You’re asking me to prove what I say by an invalid method, which is impossible. You can only tell what’s right by understanding the maths. But I’m curious now to see what you’ll do with it, so here you go. Thanks for proving my point. I’m not the one claiming conspiracies here. Not publishing is not a big effort. Publishing is. And looking at peer-review is a good first filter, in the same sense that assuming correlation implies causation is, or that professional-looking typesetting is evidence of quality and hence truth. It’s fine for everyday use, but not for Science. Scientific method explicitly rejects it. And the scientifically literate layman, (which I sort of assumed was what this site was about,) ought to know that. Peer review doesn’t do what you seem to think it does. Something being in a textbook is a good first approximation, but something being published in a journal most definitely is not. I hope we missed each other in posting, Nullius, because otherwise you’re hopeless. Things aren’t true merely because you keep asserting that they are. No one is making an argument from authority. Asking for peer-reviewed articles is simply a time-saving technique. It ensures that the work has passed at least rudimentary scrutiny, and often very good criticism and vetting. That’s all. No one is saying something is right because it’s peer-reviewed, nor are they saying something is wrong because it hasn’t passed peer-review. If you don’t think asking for peer-review is a valid way to expedite discussions, then I’d love to hear your detailed opinion on this novel system of physics I’ve discovered. It’s called TimeCube. If you have trouble following it, it’s because you don’t understand the maths. BTW: It’s true that demanding an article link can be a passive-aggressive argument from authority. OTOH, it’s also an excellent want to check up on the story. The alternative would be to make you lay out all the math here. That’s hosted at RealClimate, and if you really *want* something that isn’t peer-reviewed I know the RC forums discussed this matter quite a bit. You’re confused Nullius. Showing how other published papers confirm Mann’s work is not arguing from authority. While I don’t have access to the link, the obvious answer is to follow up on those who cited the paper. What’s concluded in those papers that cited the McIntyre paper is a consensus with Mann. McIntyre is the odd man out. And looking at peer-review is a good first filter, in the same sense that assuming correlation implies causation is, or that professional-looking typesetting is evidence of quality and hence truth. It’s fine for everyday use, but not for Science. Scientific method explicitly rejects it. Wait wait wait wait wait. The scientific method “explicitly rejects” peer review???!! You must be reading some new and improved version of the scientific method here, buddy. Either that, or you’re certifiably insane. Nullius, one of three things has occurred: (1) I am explaining my point very poorly, (2) you are not reading, or at least not comprehending, my point, or (3) you are hopeless, as I worried about in my last post. On the off chance that door number three isn’t the correct one, I’ll point out that I ***absolutely did not*** say that something in a peer-reviewed journal was a “good first approximation.” On the contrary, I said that peer-review was a good first approximation at determining if a study is worth a crap. Please read what I’m saying again, if you care. Did the disturbingly passive-aggressive Nullius just say that the scientific method “explicitly rejects” peer-review? Have you ran that statement by an actual scientist? Let me know when you do. It matters in what journal the paper was published, how long the paper has been out, and what its claims are. Most papers actually add very little new data to their respective field and their claims are tentatively made. Science textbooks are rife errors because they often demonstrate the bias of the main authors. I know for a fact that this occurs often in Medical textbooks, pathology textbooks and especially genetics textbooks. The error-correcting process is inefficient. To be honest, reviews of the literature are where it’s at. Scientists don’t read textbooks because they are dated and error-prone. ChrisD, Thanks for proving my point. I’m not the one claiming conspiracies here. Sorry, but if “The journals won’t publish anything skeptical” isn’t one of the main planks of global-warming-is-a-hoax, I don’t know what is. Though as a general rule I think scientists don’t read textbooks simply because they generally know of a better, more specific source of information than because of their many personal flaws. True, medline, pubmed and google are just a click away. So long as that’s all you’re using it for, that’s fine. But it depends what step of the process you’re on. If you start from the point of view of finding interesting things to study, then peer review helps to find them so that you can study the maths and the evidence, and then you consider whether the arguments stand up. In this case, we had already got to the maths, so why step back a stage to looking at peer review? Generally, peer review means nothing more than ‘worth looking at’. It’s dangerous to use it for anything else. The rest of the paragraph I agree with. Regarding TimeCube, if I can’t understand the maths, I’ll express no scientific opinion on it. Anybody can form and express a non-scientific opinion for any reason they like. Political beliefs, religious beliefs, peer review, or the authority of the United Nations – or based on whatever heuristics and rules of thumb you like. But to express an opinion and claim to be backed by science in it, you have to understand the scientific details. Argument from authority cannot constitute such evidence. You can always say that from a scientific point of view you don’t know, but that personally you believe it to be rubbish. But if somebody else personally believes it not to be, you cannot call on “scientific authority” to arbitrate between you. That’s a political debate. I understood what you meant. In a certain sense, it’s right, but it’s not the only such criterion, or the most important one, and I’m suspicious of people bringing it up when it has been used so often in the past as reason to accept or dismiss an argument without even considering it. I asked a question about the maths, and gave my reasons in terms of the maths. I would therefore expect a mathematical answer – not to be asked whether the question has been peer-reviewed. You might find peer-review helpful in your search for such an answer, (should you choose to answer it). But how you go about that is your own affair. The contents of the papers may be a useful source for arguments, so long as you understand that what matters is the content of those arguments. That’s what I’d expect a debate on the science here to be about. But I’m still waiting for the answer to my first question. What was Mann’s original mathematical justification for decentered PCA? Because without it, everything that follows from it is invalid. The fastest way to get to the root of the dispute is to examine his proof, compare it to ours that no such proof is possible, and see at what step they diverge. If one of the critical papers gives such a proof or argument, then it makes it easy for you to explain the maths and how it can be valid. I would have thought that you guys would be as keen as me to get it out there, in simple and comprehensible form, so that you can argue the case directly rather than by comparing citations. I think it would help your side enormously (assuming you’re right, of course). Doubt plays into the hands of denial. Thanks for the link, but gillt already cited it above. And as I said, it doesn’t address the question. It repeats the calculation in a slightly different way, gets the same result, and claims thereby that any errors there might be in the original don’t matter. Even without the problem of them using Mann’s decentered PCA as input themselves, it doesn’t answer the question about whether Mann’s method was right. If you pull the maths from those papers to help you explain decentered PCA here, I’d agree. I wouldn’t even mind if you gave a reference to a document (peer-reviewed or not) if I could thereby get to the maths with one click. But the point is the maths, not the fact that it is to be found in papers. And linking to papers that don’t contain the maths is just a waste of everybody’s time. Consensus is irrelevant, except maybe to guide a search. The question is, what was the argument that convinced them? You’re right about textbooks, too. But on the whole, textbooks are more reliable than just-published papers. Where do you think the textbooks got their information from? As a basis on which to determine scientific truth, yes. It’s a purely editorial function, for the purposes of efficiency. “Does your index list subjects in alphabetical order? Does your data have proper configuration control? Do you number your equations?” It makes it a lot easier to find things if it does, but it wouldn’t bear on whether the maths is correct. Peer review is not a part of the scientific method – it is instead a part of the efficient conduct of scientific research. Scientific checking is supposed to be done by the process of replication and falsification, by the readers of the paper. Does your index list subjects in alphabetical order? Does your data have proper configuration control? Do you number your equations? This is what you think people do in peer review? You might have an argument that peer review is, in actuality, peripheral to the actual method itself. But to say that the scientific method “explicitly rejects” peer review (e.g., excludes it from the proper conduct of science???? No. I don’t think I can explain it as well, at certainly not as completely, as either the paper or the “collected wisdom/folly” of the RC forum. And I certainly don’t want to take the time. You just seem so certain you’re correct – I thought you must have already taken into account criticisms of your critique, and had a ready answer. Scientific checking is supposed to be done by the process of replication and falsification, by the readers of the paper. …which, when those readers replicate and falsify, is done through peer-review. Shocker! …Unless you’re talking about Jim Nobody without any training trying to discredit a paper and not having to run it through peer-review to make sure it meets its mettle. If that’s what you’re talking about, it’s time for me to go put my denilaist socks on, ’cause it’s denialist time. …IMO this is the fundamental problem with AGW science. It is so invested in computer models and statistical methods that it ignores data the can actually be observed and measured. Those are actual measurements, from NASA and ESA satellites. No. I just explained. Replication and falsification are done by other researchers in the field reading the published papers, and trying to replicate the results. They are not done by peer review, which is a cursory filtering process to say “this is worth you spending time trying to verify.” Peer reviewers are not required to check calculations, re-do experiments, or examine lab books. The aim is to see whether the paper is :- likely to be of interest to the journal’s target audience, not an already known result, provides enough information to understand and replicate, and not obviously wrong or making extraordinary claims without sufficiently extraordinarily good evidence. The basic scientific method has one scientist publish their theory or result, and all the other scientists try to criticise it or improve on it. Back in the old days, at the dawn of science, scientists used to write letters to one another directly. But this was inefficient – it took ages to hear of new developments – so they set up societies and journals to spread the news more efficiently. And then when the science being generated grew too voluminous, they sorted it into different journals for different specialisms, so a specialist in one area could quickly find the developments of interest to them. And the journals needed specialists to say whether it was appropriate for the journal, applying as much quality control as they are able in order to attract custom, while still having papers to publish. It is more like an indexing process, except instead of sorting into alphabetical order, they are being sorted by topic. But this pre-filtering is not the check asked for by the scientific method. It involves only two or three scientists, rather than the whole scientific community. And it is limited by publication deadlines and lack of budget. It is no more than a quick ‘sanity check’. It is an editorial function of journals out to make money, and can be rejected as easily for not fitting the interests of the target audience as for any blatant incorrectness. Where you get the checking inherent in the scientific method is when somebody like Steve McIntyre reads the paper, and tries to download the data and replicate it. After it has been peer-reviewed and published. Only if it stands up to such external scrutiny can it become accepted science. Peer review is prior to the first step, not the last. The other researchers in the professional scientific establishment should have done this – when the paper came out, when it was put into the IPCC report, when it got promoted to the headline graph, and afterwards when the IPCC graph was being touted around political circles to advocate for action. The other climatologists and statisticians should have downloaded the data and checked the calculations first. But they didn’t. Mann published the paper, then as editor of the IPCC chapter he put it in the report, and then they all told everybody that it was the most thoroughly scrutinised document ever, and should be taken as Gospel, or be taken to be an anti-science heretic. And when “Jim Nobody” points out that the Emperor has No Clothes, the wagons are circled by all the people who had just been busy complimenting him on his nice suit. Regarding McIntyre’s work, “not having to run it through peer-review to make sure it meets its mettle” is not how it works. You publish it – anywhere other researchers can read it – and they try to knock it down. And they have tried, so the scientific method is working fine. You can be sure that if RealClimate had found a flaw they would have published it. That’s how it’s supposed to work. The scientific journals were the 18th century way of doing it. In the 21st century, we have new alternatives. There is nothing magic about journals. They think they have. There’s even a FAQ or “Dummies Guide” or something similar on the matter. I guess the wonderful thing about the new, more informal methods of publishing is that it’s a lot easier to ignore anything you don’t feel like responding to. Regarding McIntyre’s work, “not having to run it through peer-review to make sure it meets its mettle” is not how it works. You publish it – anywhere other researchers can read it – and they try to knock it down. And they have tried, so the scientific method is working fine. You can be sure that if RealClimate had found a flaw they would have published it. I’m glad someone in here remembers what the real process is (thought the journals, and those writing in them do acknowledge that being published does not mean “settled and correct”, the current crop of students don’t seem to get it…). I am really beginning to be happy I went to school 30 years ago – it seems from the discussions in here (and my experience in grad school recently) that unless one can quote something from peer review they obviously have nothing to say as the only place any real thought appears would seem to be in the journals (while they simultaneously profess they aren’t falling for the argument from authority fallacy – which I doubt any of them even know where came from…). The thought that one should be able to think for themselves (especially after having obtained the stature of holding a degree) doesn’t seem to exist in the current generation of students. The “publish or perish” has morphed into “publish or you obviously are stupid”. As quoting from peer review is the only thing they have been taught, the possibility that one doesn’t need to do such to have a valid thought seems to go over their heads and is thus simply dismissed as being unimportant. Personally, I can’t recall ever having a desire to publish (yet every paper I did in grad school was APA format -> obviously being groomed to publish…). Over the past 20 years or so this has resulted in the attitude that one must therefore not be competent enough to state an opinion (even though they have shown competency by obtaining a degree), or god help you – disagree with something which has been published. A degree in a field used to mean one was competent to voice an opinion in that field, and while no guarantee that such commentary was without error, it was generally accepted it should not be dismissed lightly. We have in here seen the degree to which our system has been “dummed-down”, as those whom currently achieve (or are in the process of acheiving) such stature do not feel it represents any level of competency themselves. Delighted to meet you! There are actually an awful lot who still remember the process, but most of my colleagues keep their heads down, and don’t comment either way. We’re far from alone. What, you mean like my request to provide a mathematical justification for decentered PCA? The problem is, I’ve looked at the RealClimate stuff, and it doesn’t answer the question. It talks in circles around it and at various tangents, but it doesn’t answer the question because it can’t. A simpler example: you calculate the variance of a set of numbers by subtracting the mean, squaring each value, and then averaging. Can you calculate the variance by subtracting the mean of a small subset of the data? Is that right or wrong? Is there any way it could be right? Or can you argue that it doesn’t matter, because you get roughly the expected answer anyway? That’s the third time Rutherford et al. has been cited. See above. The first one is more interesting though. Their argument there is that if you rotate the ‘cigar’ about it’s centre, rather than some offset point as Mann did, then the 20th century spike appears on one of the shorter axes – i.e. it was well off centre, and only the bias in the method promoted it to PC1. They then find a convenient excuse for including a number of these shorter axes, claiming it to be ‘standard’, even though the book they cite for the rule (Preisendorfer) warns against this sort of manipulation, and indeed, specifically warns that decentered PCA is invalid and incorrect. And ignoring the fact that despite their claim for it to be ‘standard’, it wasn’t what Mann did. They say the Hockeystick is to be found in PC4 when the method is applied correctly as by M+M – i.e. the fourth factor in rank in explaining the variance. The effect must of course appear somewhere in the list, as the Almagre Bristlecones and their growth spurt are a real effect (albeit not a local temperature-related one). But there is a rule in statistics that you start by defining the method/test before applying it to your data. If you look at the data and then apply tests based on what you see, it messes up the significance levels and confidence intervals in an incalculable way. Coming up with a post-hoc excuse afterwards for including PCs 1-5 is statistical malfeasance at its finest. There are a number of other points, they use RE instead of the more standard R2 as a test of fit (R2 is the correlation coefficient squared), possibly because R2 comes out around zero, indicating no skill. The theoretical distribution for RE can’t be calculated, and has to be determined by simulation. If you simulate with red noise, the threshold comes out far higher than the observed values. The theory of retained PCs is based on errors having independent identical Normal distributions, which does not apply to tree rings. And their alternative method without PCA still has near zero R2, and still doesn’t work without Bristlecones. Even if they were by all these means able to fix the method, it doesn’t make the original method right. But I’m pleased that people are providing mathematical arguments regarding the problem, finally. Although the maths they provide also has to be both relevant and correct. More along those lines, please. Good to meet you as well – someone who is actually taking a point and discussing it. Don’t expect much in the way of on point refutation here though; just a lot of “it’s in the published material” is generally all one ever gets in here. Every now and then there is a decent discussion, thus I stick around, mostly just read. The “regulars” get annoyed with me quite often (apparently having obtained a degree is no longer enough to show competency in thought), but rather like to swear up and down about peer review. I dealt with enough of that in my grad program -> I was often left wondering if the authors of papers had even read half of what they cited as I sure didn’t get their take from having read it, and at best it was questionable if anything in it was really “on point” to their argument… Lots of issues with “peer review”, but I think you have to have some upper level theory course work before you understand the limitations of it (and it has overtaken everything, so the students obviously have an unrealistic expectation of its worth). I fully understand the keeping ones head low, but I doubt many in here do. You get a lot of “if one could disprove something don’t you think they would… think of how successful and beneficial it would be to their career…” -> completely ignoring episodes such as these: http://www.probeinternational.org/files/UKVersieHenkTennekes.pdf, and http://cliffmass.blogspot.com/2009/12/climategate.html (5th paragraph explains how beneficial it was to his colleague..). The majority in here seem to still be in school, still working on their degree and thus suffer from youthful optimism and a lack of understanding how bureaucracy works -> making waves does not make one brownie points (learned that one first hand working for the government, part of my view of experience providing a very added bonus in understanding over simply being in the ivory towers…). I feel the same way about “real climate” – interesting, but they don’t ever actually answer anything in there. Then again, it was set up to be a “talking points” type blog, so one shouldn’t expect any really challenging commentary there. I don’t think they get that whatever level of my agreement or disagreement I will continue to ask questions. I was taught and trained to be diligently skeptical, and it has proven very beneficial to be such over the course of my life. The last thing I would want to be is a trained parrot only capable of repeating the current fad in thinking. I really do wish when one asked a question they pointed to a specific piece of the literature instead of just going “it’s all in there (somewhere…). At any rate, it’s a pleasure to read you posts, very thought provoking and actually about science! No, just “published or you’re probably a crank.” There are sooooo many unpublished cranks. I doubt many think you’ve got to be published to have a decent opinion. OTOH, it’s nice to see someone’s tether to a reality where conspiracies don’t run things. AFAIConcerned it’s actually covered at RC. (I did a search using just “PCA”, IIRC.) Since this whole thing is a few years old I hope you’ll understand the disinterest (perhaps general) in engaging with you over the matter now. Remember my original question – I was curious about a new response to the responses, basically. But much like whether or not there’s any climate change worth being concerned about, Iraqi WMDs, or a real baseball team called the “Cubs”, I’ve already argued about the original matter as much as I care to. and Jon, wherever you are, I asked your question on the air…. You are obviously downplaying the role of peer-review to support your own argument. Not only that but you left out an important task of peer-review that relates to the discussion. 1. Peer-reviewers are asked to make sure the Results support the Conclusion(s). It’s completely irrelevant whether the claims are extraordinary, they just need be supported. This means reviewing the methods and all the published and supplemental data. 2. And suggest specific additional experiments or/and data that’s missing, which is very common. Once the article is published it also must withstand the test of time. Since Climate Change is a fast-paced field, and the PCA controversy you’re going on about is at least 5 years old, which is like a century ago in science time, you need to be open to the possibility that you believe in a widespread science conspiracy. In this, the first of three special-edition epsiodes featuring D.J. Grothe, Vic Stenger discusses The New Atheism, contrasting it with the old atheism, in that it is more uncompromising in its critique of religion and God-belief. He defends the view that a soft stand on religion for the sake of science education is unacceptable, because the evils resulting from religion demand a vocal response. He describes his own history as an author critical of the paranormal and how this further fueled his atheism, contending that skepticism of the paranormal may lead to skepticism of religion. He talks about Carl Sagan and Stephen J. Gould, and their reluctance to criticize theism, and argues that sometimes, contra Sagan’s famous line, “absence of evidence is evidence of absence.” He defends making a positive statement that God does not exist—beyond a reasonable doubt—as opposed to merely stating that one lacks belief in God. He wonders if authors Susan Jacoby and Jennifer Michael Hecht should also be considered New Atheists. He describes lines of positive evidence from cosmology, physics, biology and neuroscience that he says necessary leads to a conclusion of atheism. He tells why he doesn’t think the battle over evolution education should take priority over the New Atheist’s larger war on faith, and why rationalists should not unduly seek the support of religious moderates and religious supporters of science. And he shares his optimism about the growing popularity of vocal, uncompromising atheism, especially among young people. – The actual information text on the actual podcast. You get it by clicking on the (i) at the end. I wonder if you are aware that Phil Jones says that sharing raw data and methods for independent verification is, in fact, NOT traditionally done in science, and that during the peer review process of his own papers NOBODY had ever asked for his raw data or methodology? That was reported in a story here, but I believe Jones’ testimony is also on youtube. I didn’t leave it out. It’s in the last clause of the quote. I believe that decentered PCA is mathematically incorrect (obviously so to a mathematician), despite it being obvious I’m still open enough to the possibility of error to ask the question, and nobody here has managed to give a mathematical explanation of why it isn’t. What am I supposed to conclude from that? In saying that PCA requires subtracting the mean of the whole dataset, not a portion of it, who exactly is claimed to be conspiring? The obvious response is to ask are you“open to the possibility that you believe in a widespread science conspiracy”? Do you think all those mathematicians who would say centred PCA is correct are conspiring?